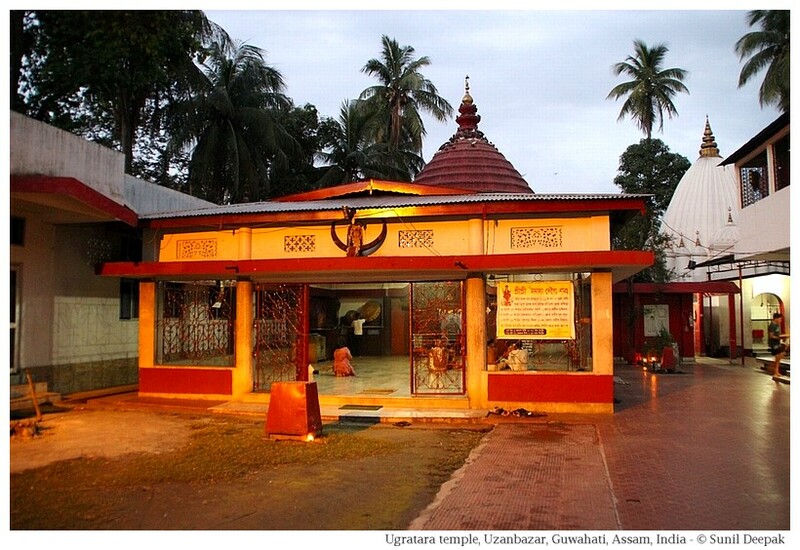 Uzanbazar is an important social, cultural and historical area of Guwahati, spread around the Dighalipukhuri pond. This second part of the Uzanbazar walking tour will take you to the different places on the northern side of Dighalipukhuri, the part towards the Brahmaputra river. You can also look at the first part of this tour focusing on the southern side of Dighalipukhuri. 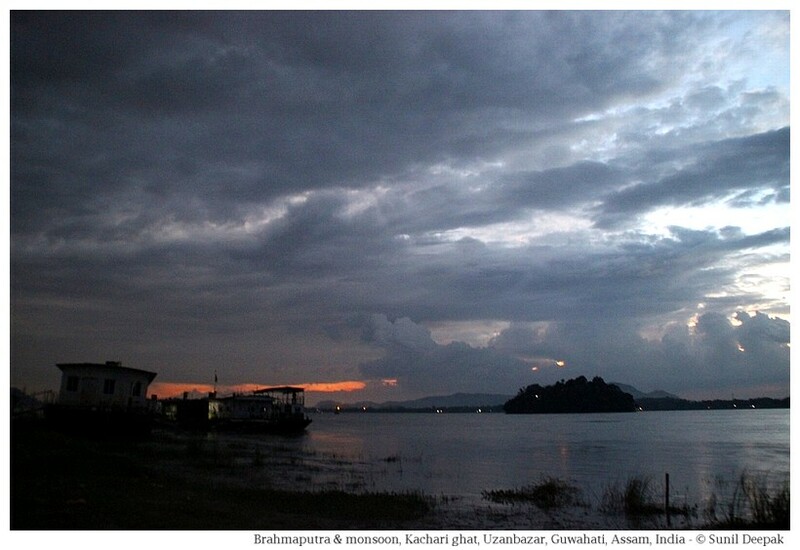 The image below shows the Brahmaputra river seen from Kachari ghat in this part of Uzanbazar. The swirling water of the swollen river and the monsoon clouds painted in broad brush-strokes by the nature, make it a fascinating place. I remember sitting there and passing hours looking at the passing boats and people. This walking tour will start from the west at the Northbrook gate and cover three important temples – Shukreshwar, Umananda and Ugratara, as well as some other buildings such as the high court, planetarium and the cricket club. Northbrook gate was built in 1874 to welcome the British Governor General of India Lord Northbrook, whose ship was anchored here. He had come here to announce that Assam province will have its own high commissioner. After 1850, as the British import of tea from China had declined, Assam had become important to the empire for its tea gardens. After his visit, for 40 days “Gowhatti” had become the capital of British Assam, before the capital was shifted to the cooler hills of Shillong. At that time the city population was only 11,000. British called this gate the Gateway to Assam. 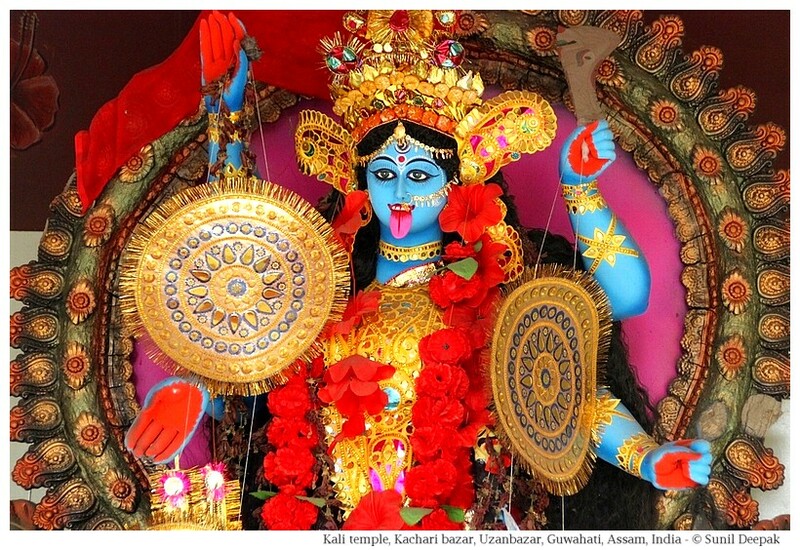 It is located on M. G. road, where the road leaves the Brahmaputra river and turns inwards. It is a simple gate made of 12 arches, 5 in front, 5 at the back and 2 on the sides. In 1897, there was a big earthquake in Assam with widespread damages in Guwahati. Northbrook gate was one of the few buildings that had survived this earthquake. In 1919, poet Robindranath Tagore had rested here before going to nearby Jublee park for a public meeting. In 1949, the urn containing the ashes of Mahatma Gandhi was placed here before their dispersion in Brahmaputra river. From Shukreshwar ghat near the Northbrook gate you can hire private boats for visting the Umananada temple and island in the middle of the river. However, if you do not want a private boat but want to use the public ferry for this visit, you need to walk to Kachari ghat (explained below). Beginnings of modern Guwahati: The lower half of Assam came under the British rule in 1826. British author William Robinson in his 1841 book "A descriptive account of Assam", explained that at that time the city covered an area of about two and half miles on the south bank of the river. He wrote that this area had one of the old chowkis for controlling entry into the city – the Lattasil chowki or Pani Chowki. At that time, the ruins of some of the old gateways to the city were still visible, though the city had lost its ancient importance and its numerous spacious tanks were choked up with weeds and jungle. Thus,when British arrived in Assam, the ancient city of Pragjyotishpura of the Kamrup empire was in decline. The new city of "Gauhati" (also called Gowhatti) took birth around Uzanbazar, especially in the areas near the Northbrook gate. 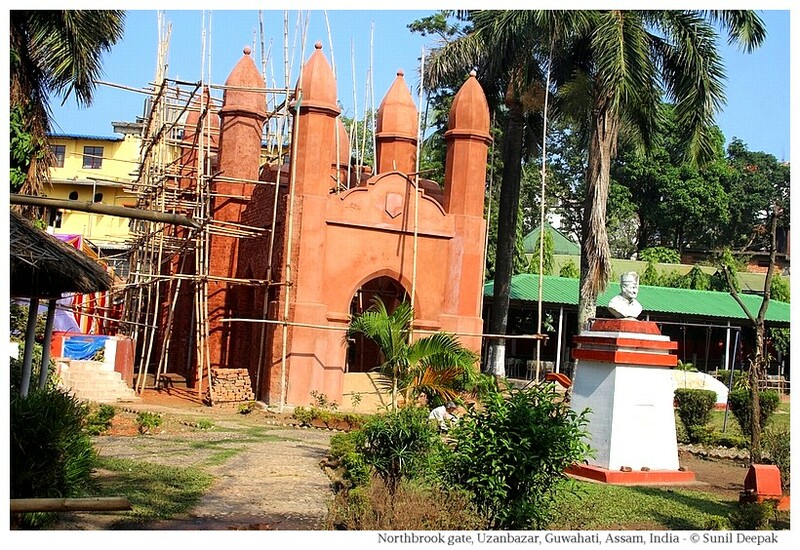 This temple is situated close to the Northbrook gate and was already there when the British had arrived in Guwahati in the 19th century. The Shukreshwar complex hosts many temples, including a famous Shiva temple on the top of a small hill where the inner walls are covered with hundreds of flowers. Since this temple is dark inside and the use of flash is not possible, I do not have a good picture of this temple, but it is really worth a visit. The courtyard of the Shukreshwar temple complex is full of colourful statues, including the Vishnu statue presented below. 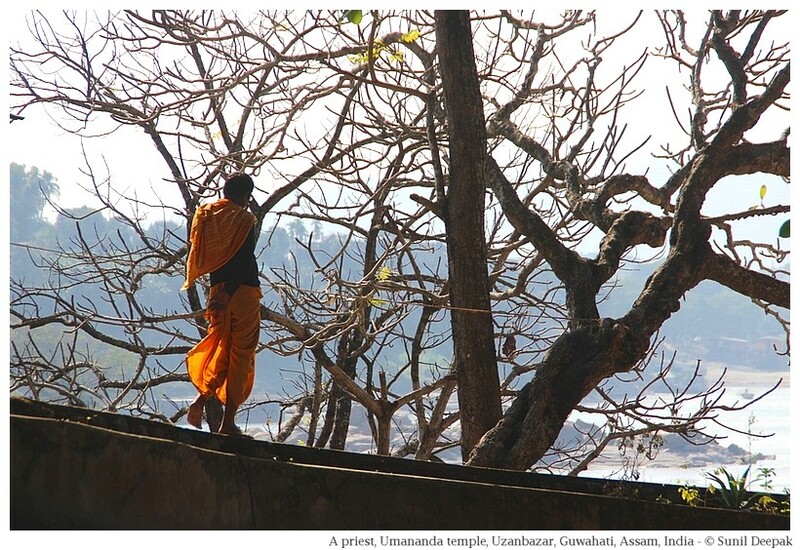 The temple complex overlooks the Brahmaputra river, where the rocks have some 1500 years old rock-cut sculptures. You will find some more information about these rock-cut sculptures in a separate section further down in this post. As you will walk further down the M. G. road you will see the Assam High Court building and Guwahati Ashok hotel, followed by the Cricket club grounds (Judges' field), which used to be the officers' club during the British period. 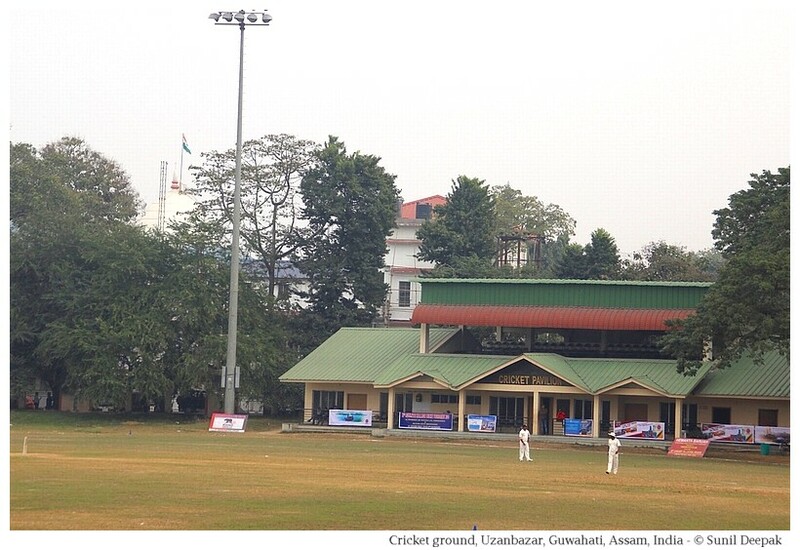 Near the Cricket grounds are the the Latasil grounds, whose name remembers the old chowki with its gateway (Lattasil chowki or Pani chowki) which had once marked the entrance to the medieval city of Guwahati. 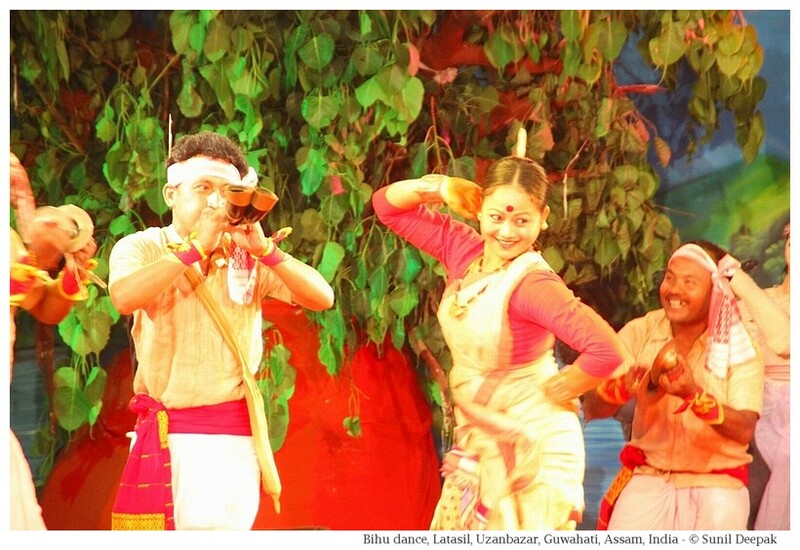 Latasil grounds are a popular venue for the different city festivals including the Bihu celebration (Bihu dance and a pani-puriwala at Latasil grounds at the Megh Bihu fair are shown in the two images below). 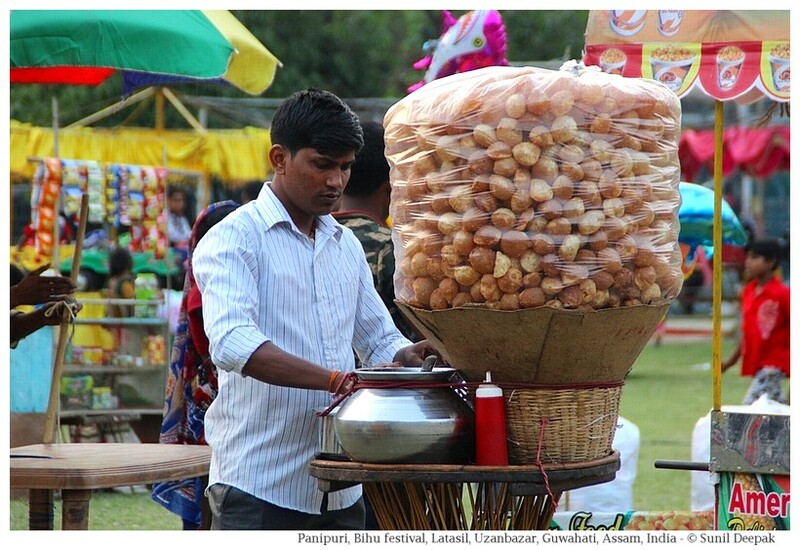 The road next to the Planetarium will bring you to the river and to the traditional market of Kachari bazar and ghat. The name of this area "Kachari", means court and makes reference to the high court. 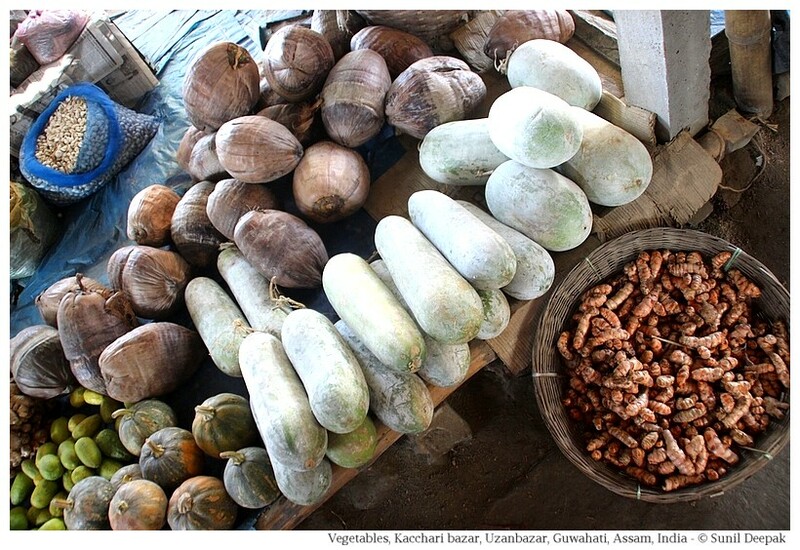 Kachari bazar is a simple market with small shops and tin roofs, but it is famous because you can find a wide variety of traditional Assamese vegetables and plants that are not available in other parts of the city. The market has a small but beautiful Kali temple. Steps near the Kachari market take you down to Kachari Ghat where you can get the public ferry for Umananda temple. 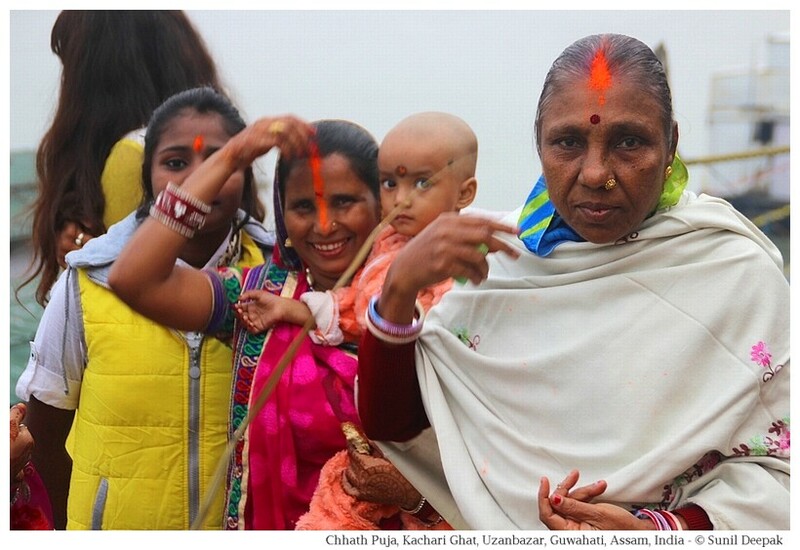 The grounds of Kachari Ghat are a popular venue for cultural events like the annual kite festival and the celebration of chhath festival by the Bihari immigrant community of Guwahati (in the image below). The Indian Railway association was formed in 1845 and the first train journey in India took place only in 1851, so I think that the “station” mentioned by Robinson in this paragraph refers to a local boat station, perhaps near Kachari ghat or near Shukreshwar ghat? 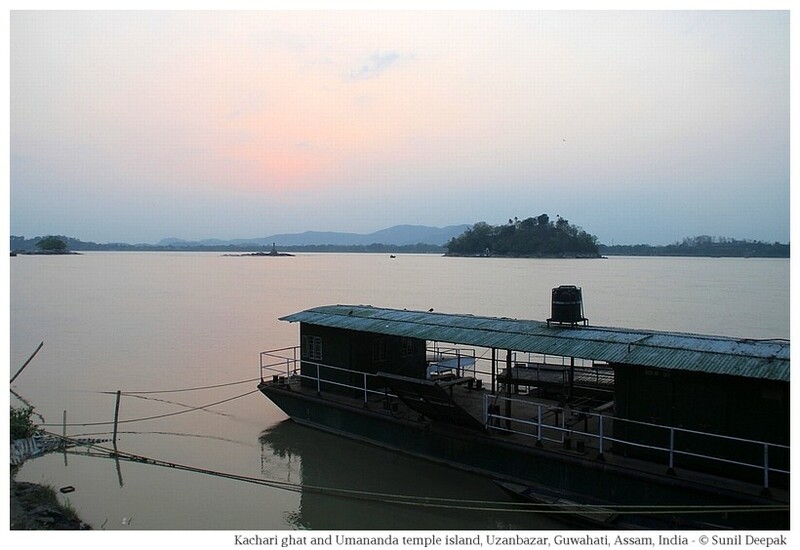 The image below presents the Kachari ferry dock with the river island hosting Umananda temple in the background. From here you get the public ferries for visiting the temple. The return ticket on the public ferry boat to Umananda temple on the peacock island costs only 20 Rs. The temple is located on the top of a hill and requires a bit of a climb. The image below shows one of the temple priests. The Umananda island is also home to a group of Golden Langur monkeys. Usually you will find them on the trees, if you take a walk going towards the back of the island, below and behind the main Umananda temple, on the path facing the north bank of the river. 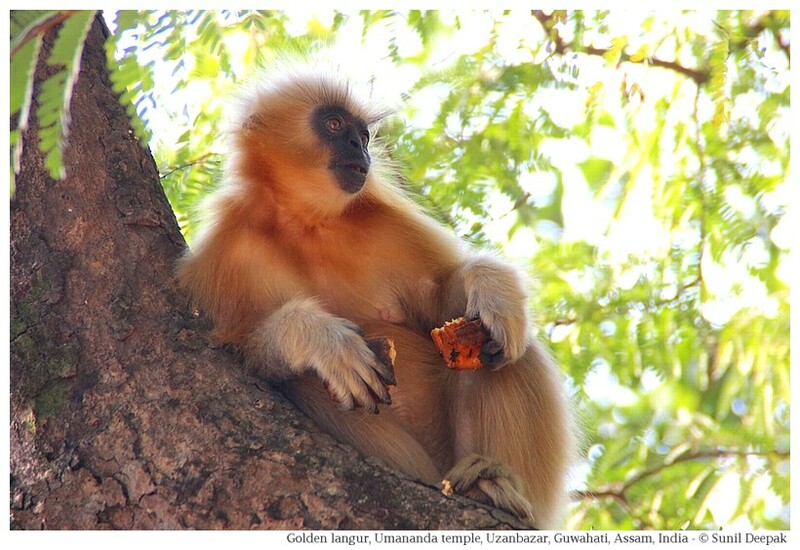 (A golden langur in the image below, eating a cake given to her by some visitor). The island is also home to a group of friendly geese who might follow you around and even ask you with their quack-quack to share your food. They have learned that people do not hurt them, so they seem completely fearless. The views of the other river islands with their pristine white sands, visible from the top of the Umananda hill if you look towards the north bank of Brahmaputra, are breath-taking. The road along the river going east from Kachari ghat towards the Kharguli hills and the Governor's house has many traditional old Assamese houses. 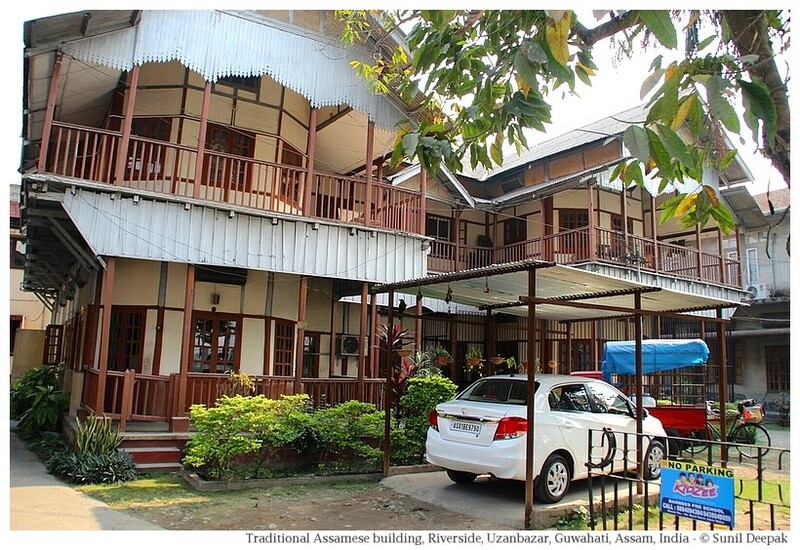 Vivekanand Cultural Kendra, one of the cultural centres of Guwahati, is located at its corner, just opposite Kachari ghat. Upper Stand road is home to some exclusive boutiques selling traditional Assamese silk dresses for women (Mekhla Chador), including the Fab India Handicrafts store of Guwahati. Across the road, is the fish market of Guwahati that is ideal to buy fresh river fish, early in the morning. The image below shows one of the traditional Assamese houses on Upper Stand road. 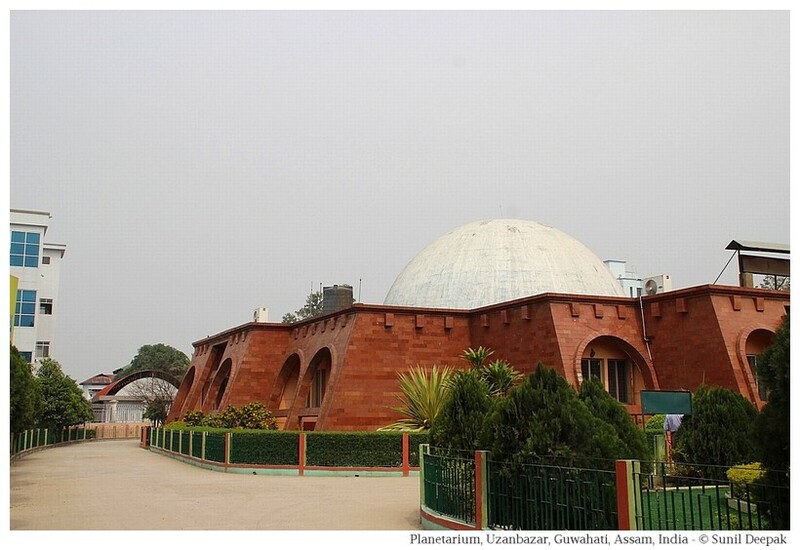 The same road that goes towards Kachari ghat along the planetarium, if taken in the other (southwards) direction will pass along the boundary of Latasil grounds and then take you to Lamb road and the unassuming Ugratara temple. It is one of the ancient temples of Guwahati built during the medieval Ahom kingdom. Behind the temple, there is a big pond, Jorpokhuri. A road was built here which divides this pond into two. The pond is famous for its large number of geese. 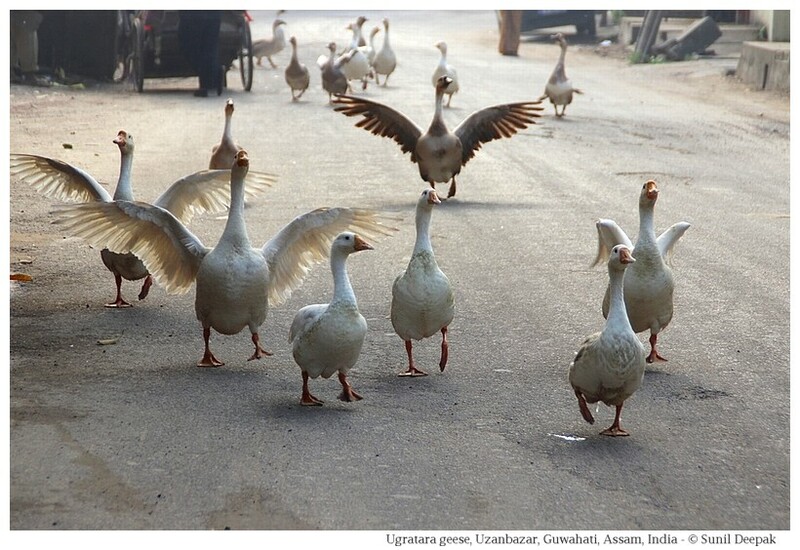 Like the friendly geese of Umananda, these Ugratara geese are also aware that people and vehicles will never hurt them so they are completely fearless. It is not unusual to see a gaggle of geese walking in the middle of Lamb road while all the cars and autos, try to pass around them without hurting them. 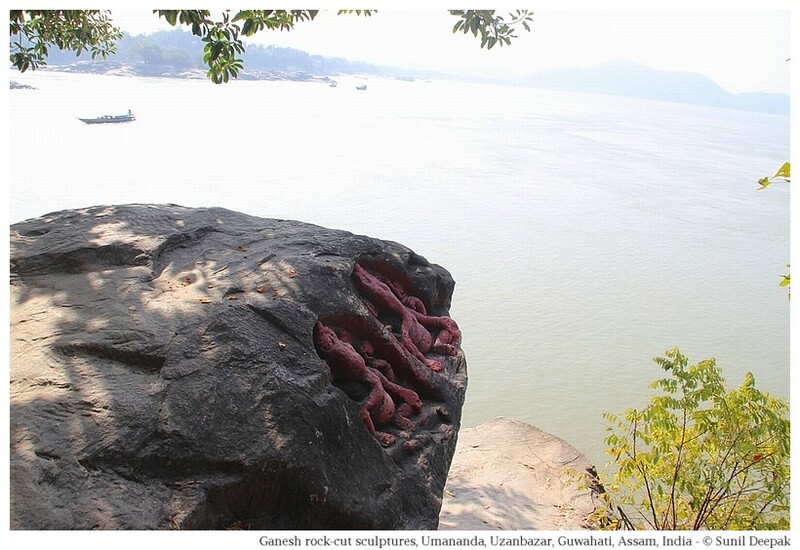 Guwahati area has many bas-relief rock sculptures, rock-cut sculptures (carved into the rock) and rock sculptures. According to Prof. P C Choudhury (The History of Civilization of the people of Assam till the 12th century A.D., 1959), the rock-cut sculptures are from 5 to 12 century CE. The visit to Uzanbazar will give you an opportunity to visit two important sites of rock-cut sculptures in this area. One group of rock-cut sculptures representing Vishnu (with adjoining figures of Surya, Ganesh, Devi, etc.) is present in the rocks facing the Brahmaputra river behind the Shukreshwar temple. 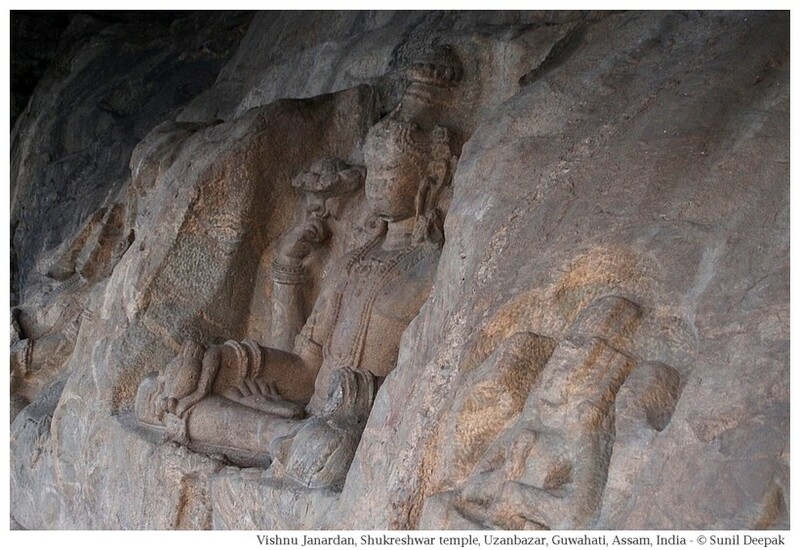 These are locally known as Vishnu Janardan and are protected under the Archaeological Survey of India. A second group of ancient rock-cut sculptures representing Ganesh are located on the island of Umananda temple, near its western tip facing the Neelanchal hill and Kamakhaya temple. Near by a path goes down towards the river, with some more sculptures. 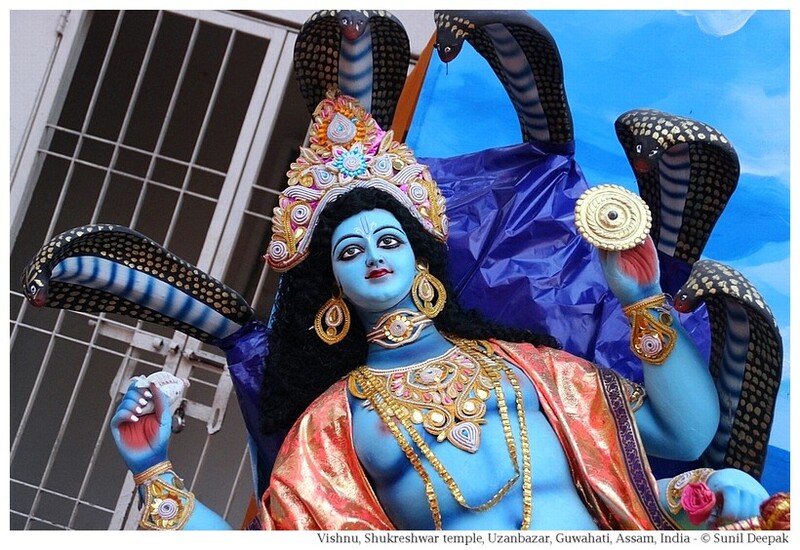 These sculptures look much older than many of the Umananda temple buildings. I think that Uzanbazar is one of the most culturally vibrant area of Guwahati with a lot of places to visit. All the places mentioned in this post are located close together and you can easily walk to them. Reaching Uzanbazar through public transport is easy and you can get down at the Kachari bus stop. You can also look at the first part of this tour presenting other places to visit on the southern side of Dighalipukhuri, towards Cotton College and Paltan Bazar railway station. Beautiful pictures. Gives a birds eye view of the city.